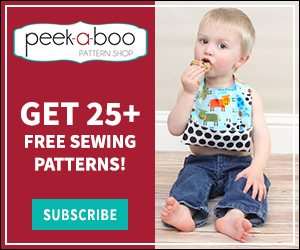 How To Sew A Knit V-Neck - Peek-a-Boo Pages - Patterns, Fabric & More! 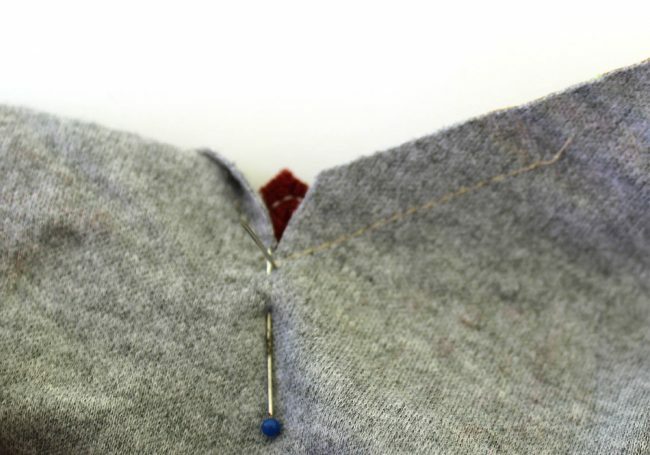 Today I will show you how to sew a knit v-neck. 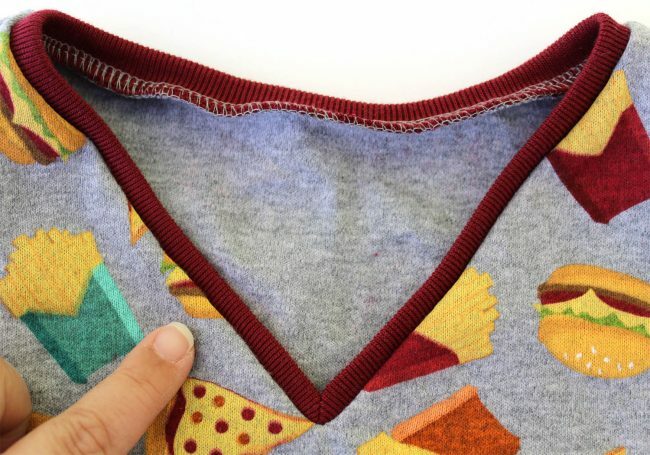 I’m using the Play Date V-Neck Tee pattern from the Peek-A-Boo Pattern shop to illustrate all of the steps, but this method will work with any knit v-neck pattern. 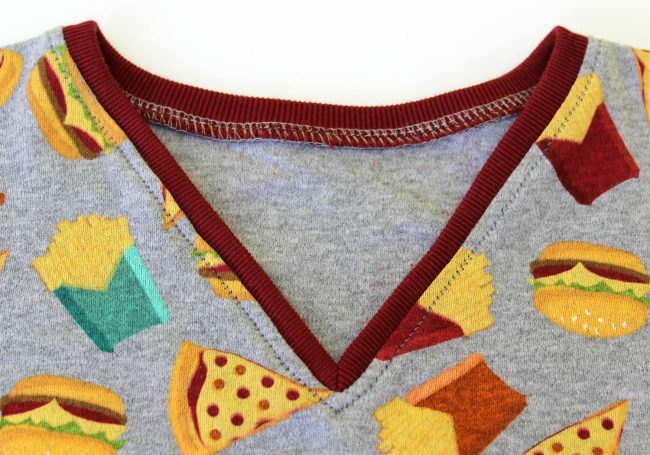 I’ve used many methods to sew a v-neck, but honestly this one is the best. It produces a nice professional looking neckline. Don’t be intimidated, it looks complex but it really isn’t. 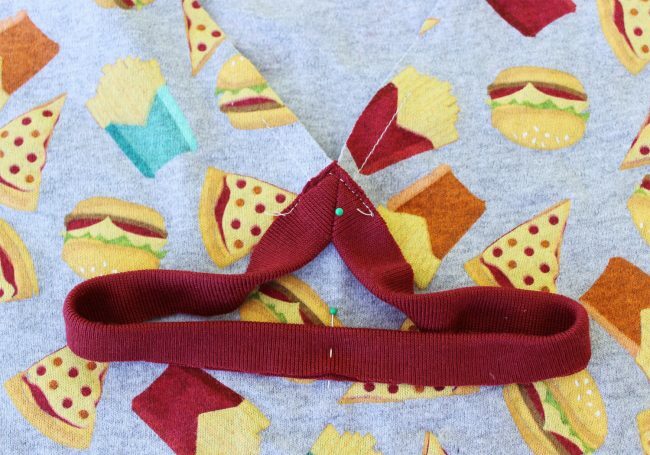 Follow along step-by-step and you too can sew the perfect v-neck. Knit Fabric (jersey, interlock, waffle knit) Wash and dry your fabric before you start! Cut out your fabric according to the pattern’s instructions. You can cut out the neckline piece either out of the same fabric or a rib knit. I chose to use a contrasting rib knit for this tutorial. 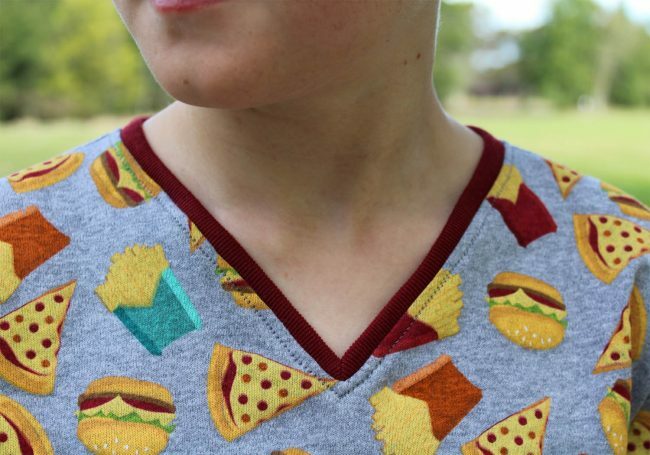 I have a photo later in the tutorial that shows a v-neck sewn with the same fabric as the body of the shirt. Either way will work and the only real difference is the look of the finished top. Start by sewing together the shoulder seams, right sides together. 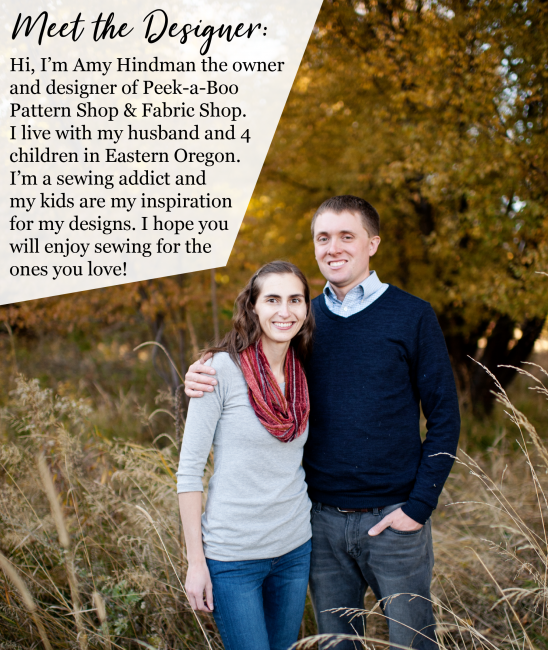 If you have serger, use it. 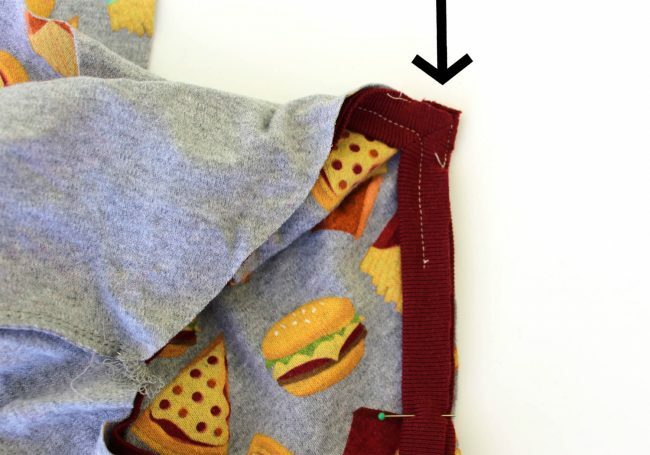 If not use a sewing machine that has stretch stitches, such as the lightning bolt stitch. Take care not to stretch out the seams if using a regular sewing machine. Press the shoulder seams toward the back. 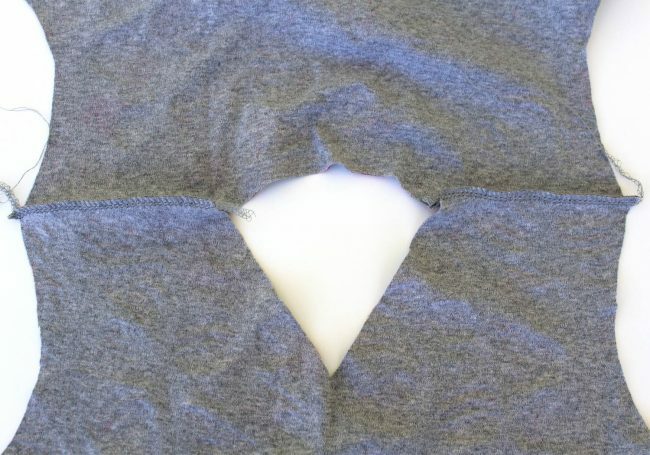 Using your sewing machine, stay stitch the “V” of the neckline, 3/8″ away from the raw edge. 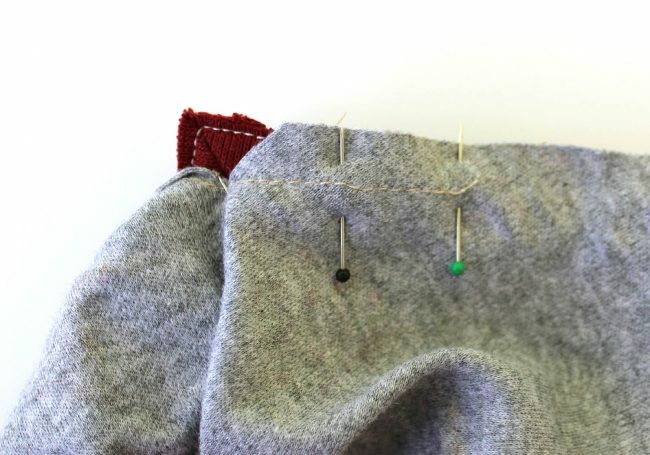 Use a straight stitch (I used a 2.0 stitch length) and stitch about 1.5″- 2″ on either side of the “V.” Leave the needle down and pivot/turn your fabric at the bottom of the “V” to create a sharp point. 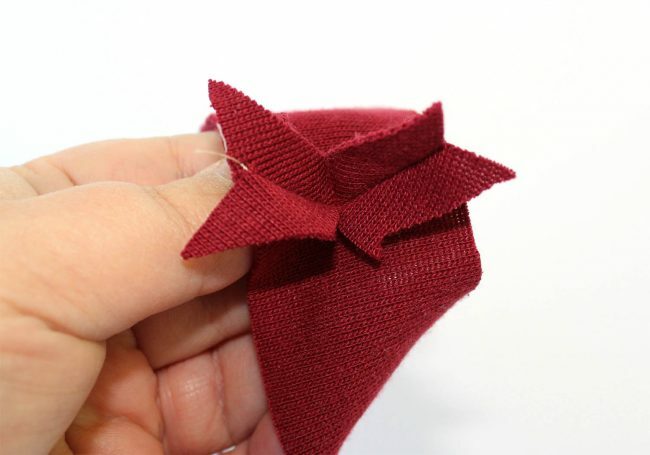 Take your scissors and cut straight down the center of the “V” right up to the stitching. Do not cut through the stitching. Next sew the neckband fabric together to create a loop using a 3/8″ seam. 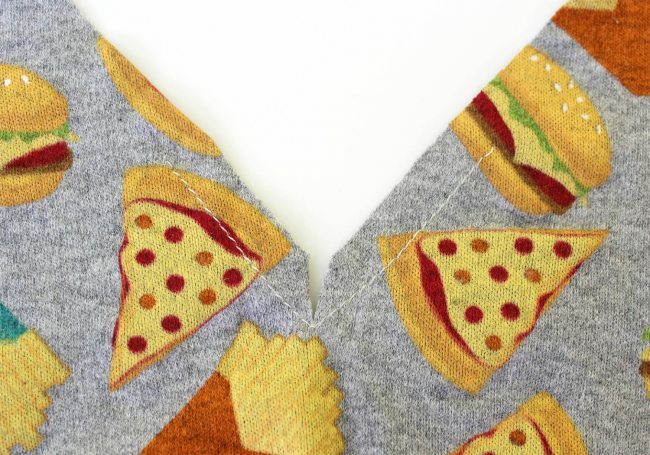 Right sides together, use your sewing machine and a normal stitch width (2.5 – 3.0 stitch length.) Back stitch at both ends and pivot at the “V” with your needle down to create that sharp point. 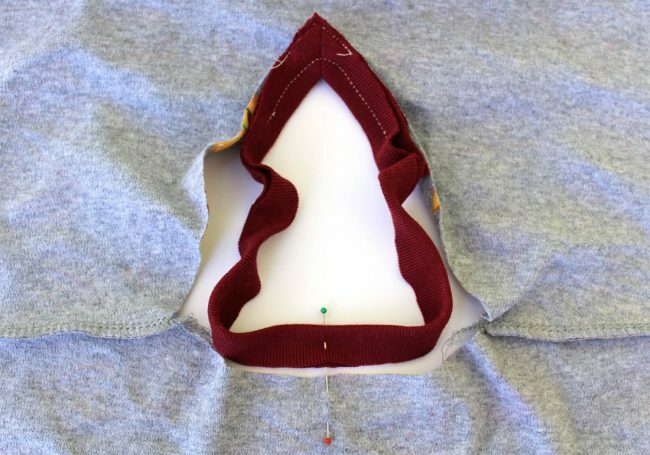 Take your scissors and cut straight down the center of the “V” right up to the stitching. Do not cut through the stitching. 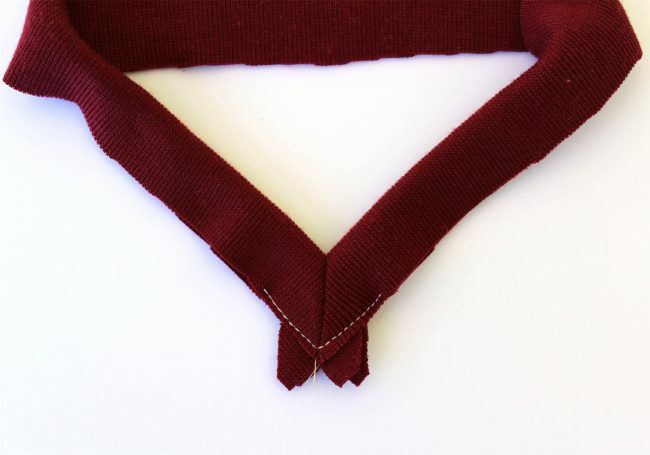 Optional Step: I like to baste/sew together the very bottom of the “V” of the neckband piece. I feel this holds it together and makes the following steps easier. 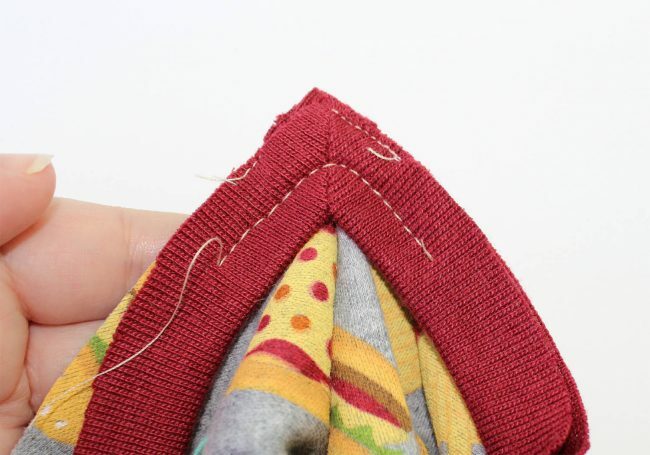 If you choose to stitch like I have above, stitch as close to the bottom edge as you can or 1/8″ away from the raw edge. 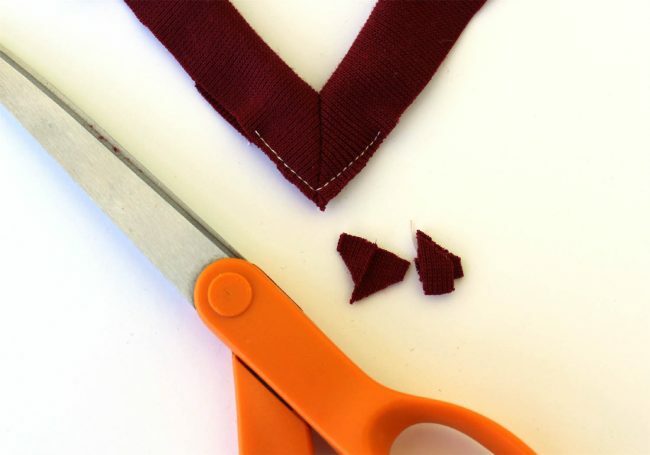 Use your scissors and clip away the excess triangles at the bottom of the neckband. Neat and tidy! Go ahead and mark/pin the center back of the neckband piece. Right sides together push the pin into the stitching at the bottom of the “V.” This step helps keep the seam line of the neckband lined up with the bottom of the “V” of the neckline. You should be working with the right side of the fabric facing out. 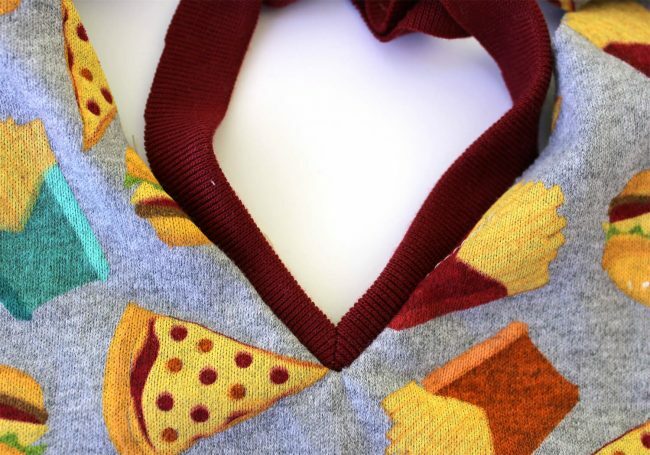 The photo above illustrates what your neckline should look like right now. Right sides of the body and neckband piece together, held with a pin. The center back of the neckband piece is marked with a pin and holding the neckband closed. Hold the pin to make sure it doesn’t fall out, carefully turn your garment inside out. You want to be working from the wrong side now with the neckband piece on the bottom. In the picture above you can see the pin still sticking out, pointing left. 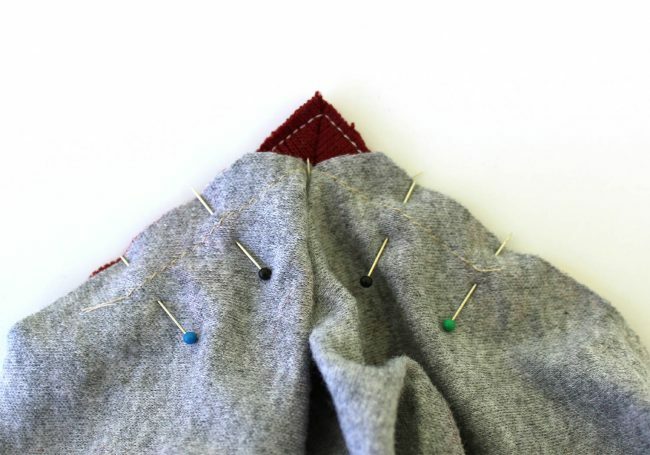 Take another pin and pin together the two pieces of fabric directly below the pin that is sticking out. You can now remove that sticking out pin. Grab the raw edge, right side of the garment opening and rotate it to match the raw edge of the neckband piece. Pin in place. I pinned two pins, the last stopping where the stay stitching stops. Do not remove that center pin! Now take the raw edge of the left side of the garment opening and rotate it downwards to match the raw edge of the neckband piece. Pin in place. I have 5 pins in the neckline right now. Two to the left, one in the center and two to the right. 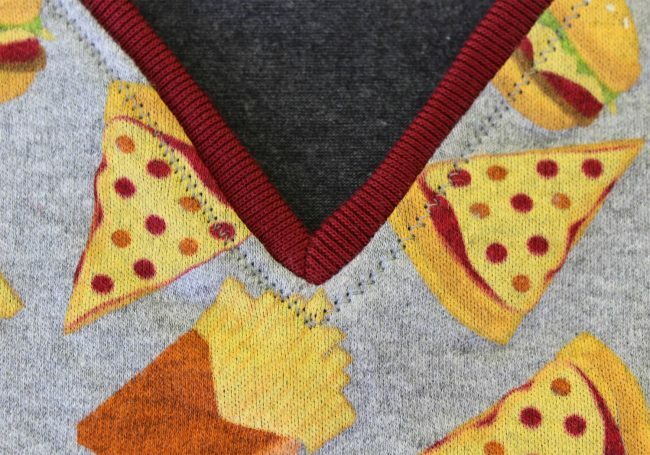 The center of the garment will be bunched up and wrinkly. The “V” of the neckband piece will be sticking out as shown above. 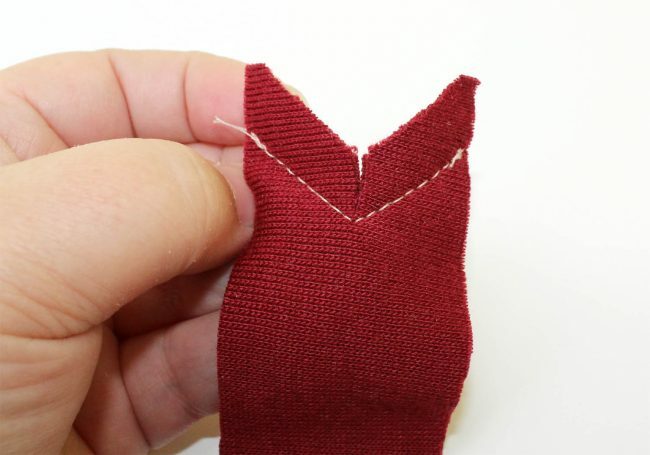 Using your sewing machine and a stitch length of 5.0 or longer, baste together the neckline. Stitch right on top of the stay stitching. Pivot when you get to the bottom of the “V,” moving around that center bunched fabric the best you can to keep the fabric nice and flat where you are stitching. This is what the basting stitching looks like from the other side. My “V” isn’t very sharp, but this isn’t as important when basting the two together. Flip the neckband piece out, and have a look from the right side. Do you like how things look? 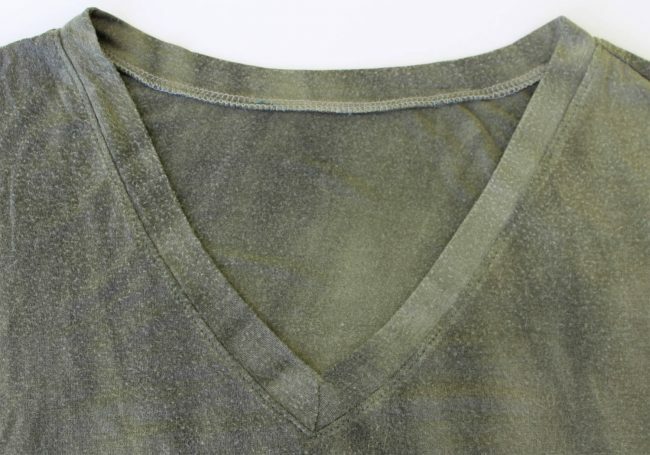 Is your neckband seam lined up with the bottom of the “V?” Is your garment fabric nice and smooth? If not, remove the basting stitches and start again. Pin again, baste again and see if you are happy with how it looks. Now is the time to get this portion of the neckline perfect. 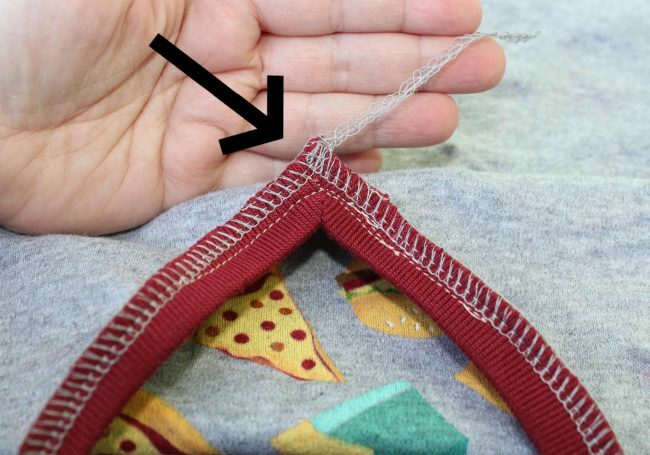 Once you are happy, flip the neckband piece down again and using your sewing machine stitch the seam permanently. Sew using a 2.5 stitch length and sew right on the inside of the basting/stay stitch stitches. Make sure to pivot at the “V” (with your needle down) to get as sharp of a point as possible. Once stitched, turn to the right side and make sure you are happy with the results. 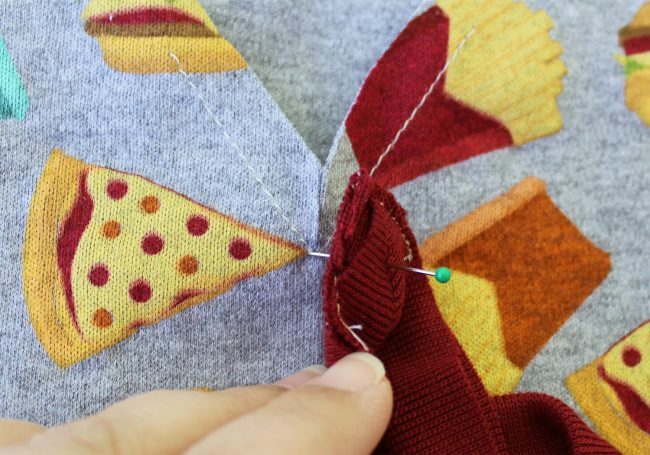 Remove the basting stitches but leave the stay stitching. Now it’s time to sew on the rest of the neckband. Mark the center back of the garment with a pin. Line up the center back pins and pin in place. Right sides together and raw edges even. Once you have pinned the center back together, I start pinning the neckline from the “V” toward the shoulder seams. You will have to stretch the neckband piece to fit. I find I have the best results when I barely stretch the neckband from the “V’ to the shoulders (stretch slightly.) The back neckband piece will have to be stretched more, but this makes the neckline lay better against your body. This is a matter of personal preference. If you find it easier, split the difference all the way around, either way works. Starting at the “V” and with the neckband piece facing up, it’s time to sew on the neckband. The black arrow indicates the starting point and direction. 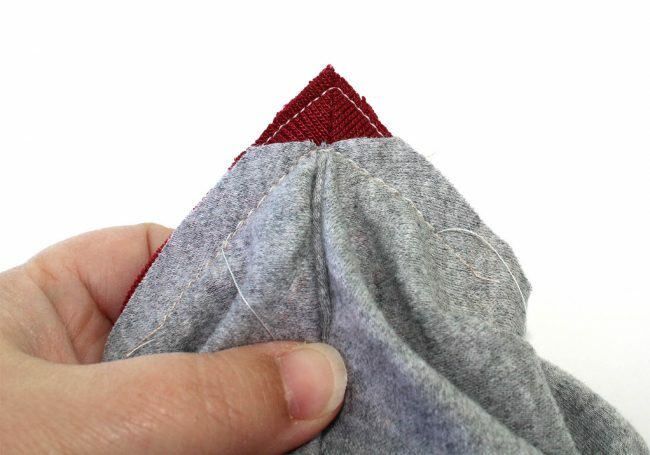 Use a serger to sew the 3/8″ seam or your sewing machine with a stretch stitch. You must use a stretch stitch for this step or the garment may not fit over the wearer’s head. Start sewing where the black arrow is pointing and continue all the way around the neckline, stretching the neckband piece to fit. Do not stretch the neckline of the garment. Once you have sewn all the way around you will end up back at the starting point, if serging just continue serging on off the edge. Finish off the serging tail in your preferred method. You do not have to sew directly over the “V” straight stitching that was sewn previously but you do want to be close, especially at the ends. Above you can see that my line of serging stitches is pretty close to the ends of the straight stitching. I made two shirts and on my second (above) you can see that my “V” straight stitching isn’t that close to the serger stitching. That’s ok too. Go ahead and flip your garment to the right side and see how it looks. My finger is pointing to the spot where the serger stitching and the straight line stitching don’t quite meet. Can you see it? No you can’t and the last step will ensure that it stays that way. Once you have sewn on the neckband piece and you have the garment turned right side out. Have a look at the neckline and see if you are happy with the result. If you are, press the neckline, nice and flat. Above you can see that my back neckline is a little wavy. The iron smoothed this away completely, the heat of the iron helped the fabric to “snap back” and all the waves disappeared. Sometimes if your neckband is too wavy, a wash followed by a iron can help fix the problem too. If you aren’t happy with the neckline. pick out the stitches in the offending area and try again. 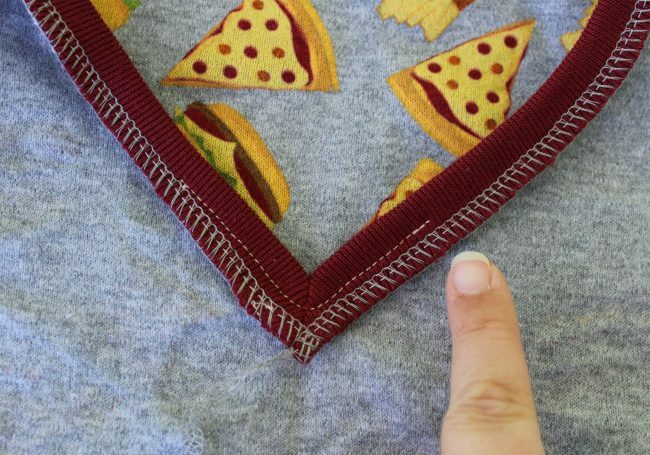 You may have to play around with your stitch settings before you sew around the neckline. I ended up lengthening the lightning bolt stitch to 4.0 to create the least amount of fabric distortion in the neckline. 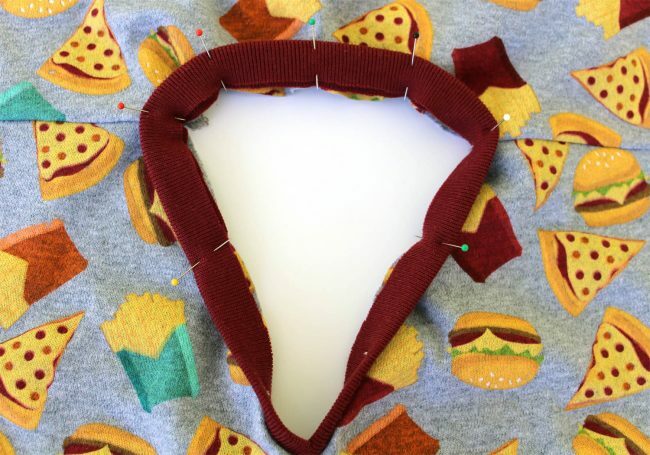 You don’t want to distort that neckline now that you have done all that work! Press the neckline one last time. Congratulations you have successfully sewn a knit v-neck! Below is the second shirt I made and it illustrates two things. The first is what happens when you don’t baste the “V” first, can you see that the seam doesn’t line up with the bottom of the “V?” It doesn’t look great but in the end I left it because my 6 year old isn’t going to care. Had the shirt been for myself I would have unpicked the seam and fixed it. Taking the time to baste the seam first really does pay off in the end. The second is the line of stitching around the neckline. I used the lightning bolt stitch and knew I needed to lengthen the stitch, but instead of just lengthening it, I made all of it bigger by increasing both settings. This ended up creating a really large row of stitches and it distorted (stretched out) the neckline. I gave it a good pressing, which helped but it is far from perfect. 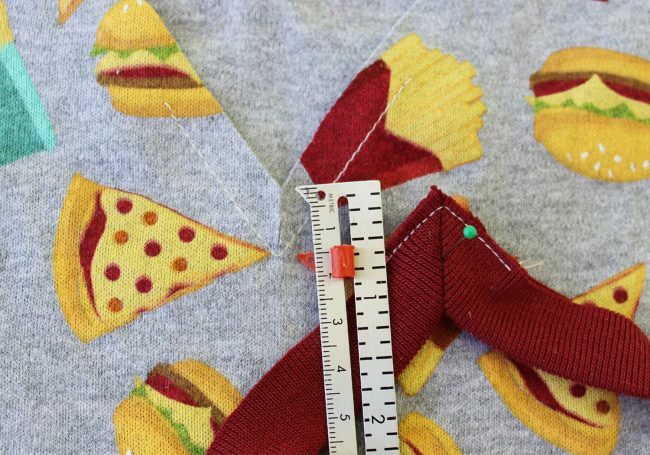 It’s best to take scraps of the leftover fabric and play around with the settings on your machine to achieve the perfect stitch for the type of fabric you are using. The next photo shows a shirt I made for myself that used the same fabric for the neckband piece. It looks equally nice, don’t you think? The v-neck pattern I used for myself is a much deeper “V” and larger neckline. It doesn’t need to stretch at all to get over my head. When it came time to stitch around the neckline for the last step, I skipped the stretch stitch and instead used a normal straight stitch (3.0 stitch length.) It gives the neckline some added stability and a nice clean finish. Just remember you can only use a straight stitch if it will fit over your head without stretching. 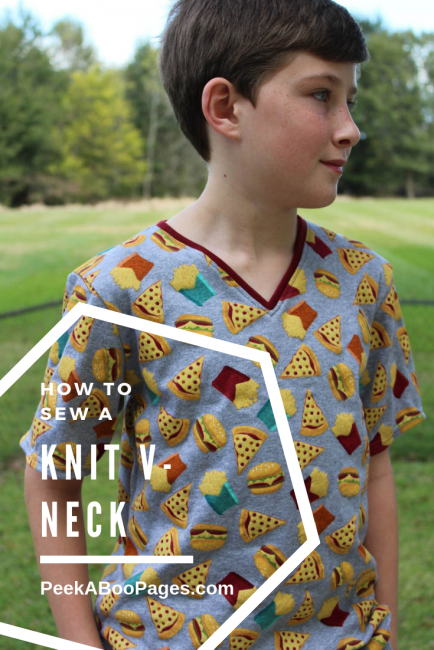 There you have it, you now know to how to sew a knit v-neck. 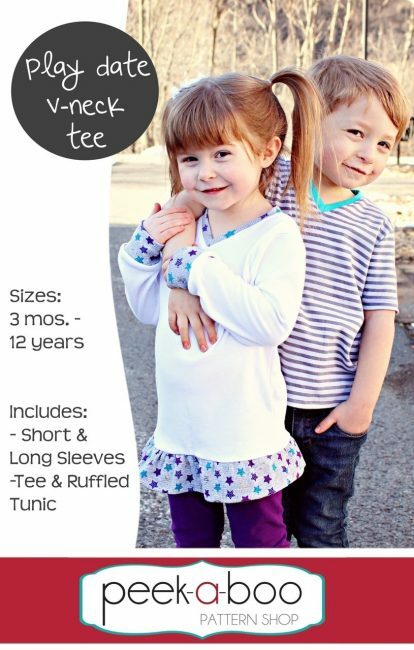 Go pick up a copy of the Play Date V-Neck Tee Pattern and start sewing! I made the size 12 for my eleven year old and it’s just roomy enough for him to wear for the next few years. This was a fantastic tutorial! The pictures are SO helpful. I’m so glad I was able to follow along. It took 3 tries, but my v-neck looks great!! !